The original King Earl Band was created by Paul King and Colin Earl, both founder members of MUNGO JERRY. In 1996 Paul retired from the band and Dave Peabody joined to replace Paul. Les Calvert also joined (ALEXIS KORNER, MIKE KOOPER) around the same time. In late 2005 John Coghlan (STATUS QUO, DIESEL) joined and added a driving beat which has transformed the band into its current shape. 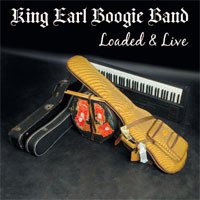 The King Earl Boogie band is a spectacular fusion of some of the best musicians in the UK today. This set features some pretty mean fusion of blues and boogie. Money To Burn is a strong opener, and the pace is maintained throughout with numbers such as 'Matchbox', 'Jelly Roll Baker', 'Slow Down' and 'Big Road'. The stand out track however, is a storming rendition of the Juicy Lucy hit 'Who Do You Love'. It's a good mix of original numbers and covers all led by the boogie piano playing of Earl who really is a master of this style of piano playing. The classic 'Who Do You Love' gets a run out whilst 'Blue State Slide' allows guitarist Dave Peabody to show off his classy slide guitar playing. ...a fine slice of blues rock, featuring the likes of Colin Earl of Mungo Jerry, John Coghlan of Status Quo...Full on stuff, well recorded. ...there's a sense of honesty and an uplifting sense of fun present...that suggests there's considerable life in these old dogs yet.